Worcester, UK. Wednesday 18th February 2015. Stanford Marsh Group Graphics (SMGG), the commercial graphics division of Stanford Marsh Group, has expanded its cutting solutions line with the addition of the Colex Sharpcut machine. Sitting alongside the full range of Fotoba cutters already distributed by SMGG, the versatile Colex Sharpcut Flatbed Cutter System is available with immediate effect. Steve Guest from SMGG comments: "The Colex Sharpcut has been designed to serve all markets with a requirement for mechanised cutting, creasing and routing operations. 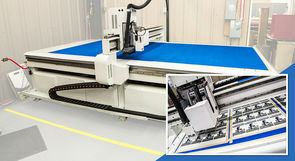 We're marketing the machines at a very competitive price-point - which includes standard cutting tools, delivery and installation - so end user customers won't get any nasty surprises in terms of added extra costs." The Colex Sharpcut's advanced engineered flatbed cutting table is designed for cutting sheet and rigid materials while delivering clean, smooth edge quality. Colex believes that no other cutting table on the market can compare in terms of price and quality. SMGG's Steve Guest continues: "Purchasers of the Colex Sharpcut can benefit from the same level of accuracy and reliability they might expect from more expensive machines - for £55K. The Sharpcut is robust, has incredible build accuracy and is highly reliable." He concludes: "The Sharpcut's competitive price means that flatbed cutting is now within reach of many more sign and display companies. Additionally, courtesy of our own in-house finance company, we are able to offer interested parties flexible financial terms and fast credit clearance on Colex machines." SMGG will be exhibiting at Sign & Digital UK 2015 (Birmingham NEC, 24th to 26th March 2015) on stand E24.